The Adam A3X studio monitors and professional referencing monitors with a small footprint suitable for many environments with limited space. The A3X from Adam is a high-quality nearfield Active Studio Monitor, designed with space and budget in mind, the A3X is the most compact monitor in the AX-Series, designed for compact studio spaces and even mobile recording setups, providing professional spec performance from a smaller, mobile speaker. The A3X features unique three-dimensional spatial representation, a controlled deep bass response and accurate sound reproduction for audio mixing, sound design and arrangement. Inside, the speaker is driven by two Class A/B amplifiers designed to be paired specifically with the X-ART tweeter and driver. Handmade in Berlin, the X-ART tweeters offer longer operation times with far fewer signs of operational fatigue compared to other speakers in the A3X's price range. Strength comes from the tweeters folded diaphragm, designed to keep distortion at bay, the unique X-ART membrane compresses and expands with the audio signal, whilst its larger size (2.5 times bigger than a classic tweeter) gives it an advanced dynamic range that delivers superb audio. The A3X's midrange driver is exceptionally lighter than drivers found in competing speakers, covering a range from 400Hz to 20kHZ and permitting a high, uncompressed SPL with superb dispersion. 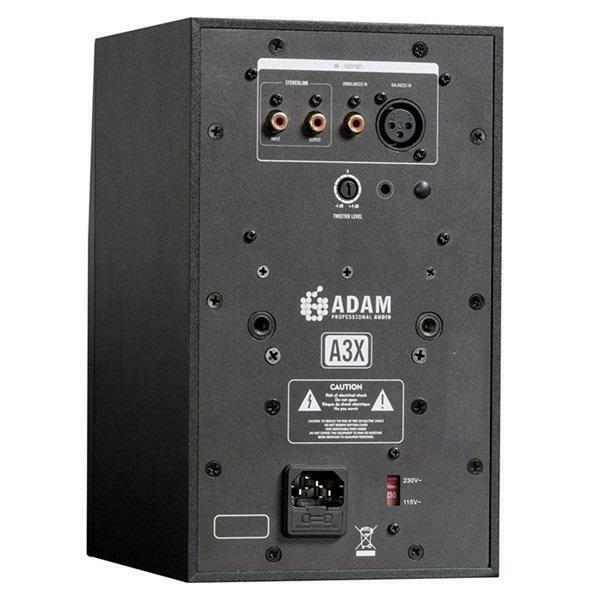 Although the Adam A3X is a small sized unit, it offers powerful, compression free reproduction even at high sound levels, with a maximum peak sound pressure level per pair in 1m >106dB. You can rely on the A3X to give you professional-quality audio for any number of applications, be it mixing and mastering, to sound design and beyond. 'Stereolink' is a feature unique to the A3X that allows you to control the volume for dual monitors via the control knob of only one. This is thanks to two additional input and output jacks for the second stereo channel when adjusting the volume control of the second monitor, only THAT monitor is adjusted, this works especially well when compensating for differences in listening distance. Praised by many in the industry, Adam monitors pair exceptional quality with practicality and affordability, the A3X is no exception, at home in a small or portable recording scenario, or as part of a top-end recording studio setup.